Delivery time is perhaps the only problem that "torments" someone who has decided to buy one of those really big superyachts. You need only think that from the moment of signing the contract to the delivery date of a 70/80 metre vessel there are about three years to wait, apart from exceptional cases. The exceptionalness of this Feadship "hull 667", built by the Dutch yard De Vries, perhaps lies in this: one of those boats that many dream of but few can buy, already built but never used. An owner who ordered it but then, unfortunately, died shortly before delivery date. "Utopia" is ready at the quay for anyone who wants to buy her for 75.000.000 euros. Cayman Islands flag and "MCA" standards observed, as a corollary to the various classifications of excellence she enjoys. 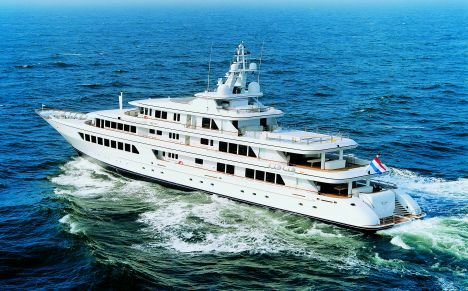 Feadship Holland: Zijlweg 148C; p.o. box 5238; 2000 GE Haarlem; The Netherlands; tel. +31 (0) 23 524 70 00; fax +31 (0) 23 524 86 39; e-mail info@feadship.nl; web site: www.feadship.nl. We went to see this steel giant with aluminium superstructure on our recent visit to Holland where the yacht was having the final touches added before she is put on the market. "Utopia" was initially to be designed as a 58 metre yacht but the customer, urged on by the desire for a boat of absolutely top level content, confirmed that the definitive length should be 234'11", equal to 71.60 metres, thus taking the yard into its biggest and most complex construction ever. There are no less than six decks. To describe them in detail would require a good deal more space than we have available here so we shall limit ourselves to what struck us most during our visit aboard. First off, the boat fully confirms the fame of this Dutch yard in terms of quality, evidence of which is practically everywhere. 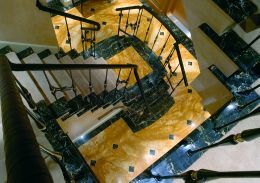 Very careful work, micrometric assemblies and a level of finish that leaves you astonished are found in each individual detail of this construction, notwithstanding its size and complexity. Aesthetically "Utopia" reprises certain solutions already successfully expressed by De Voogt Naval Architects in "Wedge Too", also for Feadship. 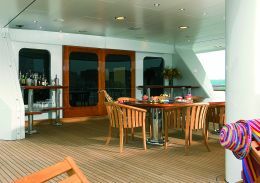 Rounded lines towards the bow in the forms of the upper decks, then plenty of glass set between one deck and the other, supplying a special feature of the exterior, "slimming down" the forms and at the same time providing a high level of interior light. The bow is very appealing, high up and soaring over the water, while the stern, decidedly lower, is successfully integrated in side view with the forms of the upper bridges which, precisely aft, are fully dedicated to life in the open air. The interiors are the work of the Redman, Whiteley and Dixon design team who developed the whole middle deck for the owner's exclusive use. The owner's cabin features a spectacular view from the forward windows and a terrace with Jacuzzi pool, comfortable deck chairs and sun-beds. The owner's en suite bathroom contains a second Jacuzzi, this time a "simple" tub, plus shower cabin, two washbasins and the WC in a separate room. Just aft on the port side there is a great wardrobe room followed by the mirrored gym which is equipped with a small service area and kitchenette, while on the starboard side there is a large room furnished as a studio for the owner. A feature of the amidships zone of this deck - and the others - consists of the access stairs, the owner's very large, the crew's, on the port side, somewhat smaller. 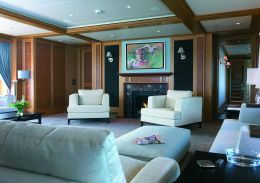 Lastly, towards the stern, the "sky lounge" opens up, a saloon with a fine fireplace, facing sofas, a card table and a corner bar, directly overlooking the external deck where there is a large dining table seating 14, plus sun-beds and so on. The next level up is the wheelhouse deck. 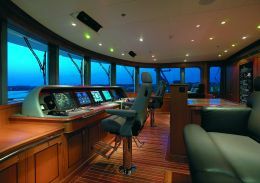 Over and above a spectacular bridge there is the captain's cabin, his office and a series of service rooms including one from which the various sophisticated on-board audio-visual systems are managed. The open part of the deck aft is actually a helicopter pad equipped with a military-derived system for rapid, safe blocking of the aircraft even in unfavourable weather conditions. 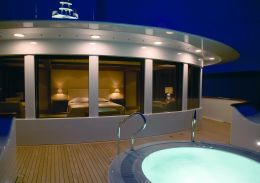 Above, partly protected by a top in composite, is the sundeck, complete with the umpteenth Jacuzzi, a bar, service furniture with grill, sink etc., sun- beds and various chairs. 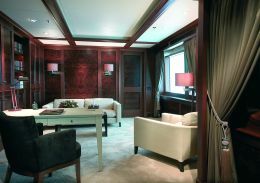 For the guests there are three important VIP cabins on the main deck, together with a guest lobby, a huge pantry and two galleys with refrigeration cells and a full range of professional accessories. 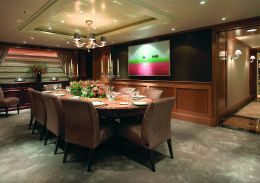 Aft on the same level we come to the formal dining room and the main saloon, both extending the whole width of the vessel and well correlated in terms of décor. 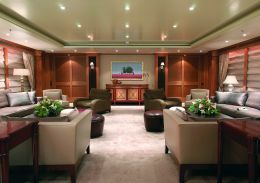 From the main lounge there is direct access to the cockpit which is roomy enough to comfortably accommodate the umpteenth dining table seating 14 and is linked to the stern bridge by a double staircase set in the transom. 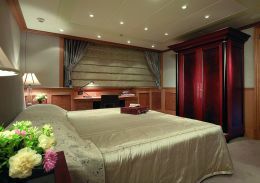 There are another two guest cabins on the lower deck, this time with twin beds but again with en suite bathrooms. The crew's quarters are on the same deck - no less than 6 double and 2 triple cabins - plus technical rooms, storerooms etc.. What literally makes you swoon is the engine room which extends on the lower deck from amidships aft. The size is "monumental". Though sophisticated it is so well organised as to appear "elementary" in its management of not only the propulsors but also all the accessory apparatus it contains. An almost aseptic unit supervised by an engineer operating from a room set in a dominant position, an actual "director's cabin", soundproofed and equipped with the best that technology can offer. Farther aft there are two garages for the two 8.5 metre tenders, separated by a room for checking the fire prevention systems, and then plenty of space for shipping jet- skis, dinghies and anything else.